Join us this Spring under the redwoods in the gorgeous stone and glass chapel atop the shores of the Pacific Ocean. Within this masterpiece designed by renowned architect, Lloyd Wright, we will journey in spirit to find the road map to heal your body and elevate your family. Erika’s movement therapy will release and prepare your body for stillness. Essie & Patrick’s angelic melodies hold a high vibration to connect with a higher self and beyond. Gina will guide you to sit at the table of unfinished business and speak the unspoken with your loved ones who hold the key to your freedom. Please bring a journal, yoga mat and dress warm. Join us to experience a Full Body Concert, hosted by Keely Angel. These concerts are designed help us perceive music in a new way, encouraging listeners to practice taking in vibration through their whole physical form, not just through the eyes and ears. These sound experiences are organized so that you have space to lie down, and our team is on site to help you find a comfortable posture, whether it's on your back or in a personalized restorative yoga pose. There is also a designated space for those inspired to move freely and dance. Chairs are available by request in advance. Live Music by Essie Jain on Voice and Harmonium. Joined by Patrick Glynn on Guitar and Pedals. An evening of guided restorative practice, meditation and live music. Essie Jain on Voice and Harmonium. Joined by Patrick Glynn on Guitar and Pedals. Kindly RSVP to press@urbanzen.com to reserve your space. 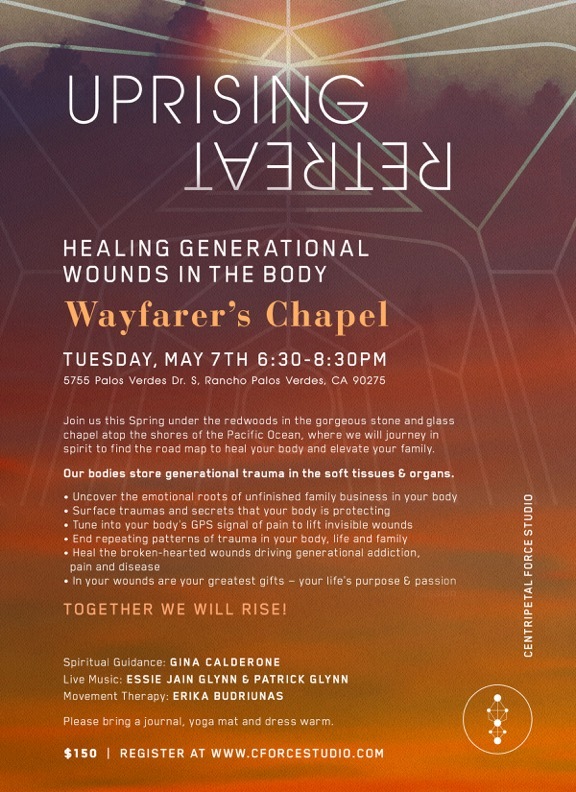 Please join us for a very special event led by physical and energy therapist Gina Calderone, movement therapist Erika Budriunas, with live music accompaniment by Essie Jain and Patrick Glynn. The evening will begin with light movement and breathing with Erika Budriunas to the soothing melodic voice of Essie Jain Glynn and her harmonic husband Patrick Glynn. Basking in their vibration, we will then come to lay down in rest, working through the channels of the body, unfolding and uncovering the wisdom path, as Gina guides everyone to connect to their loved ones and download messages in spirit that can help our minds grow and our bodies find peace. It is our hope that we can all connect with our family through spirit and settle any unfinished emotional business or diagnoses that we carry, so we can empower ourselves to live the life we imagined. The angels want to clear the unfinished business and tell you the stories they couldn’t tell you while they were here. Perhaps you'll understand the emotional roots of the generational trauma. Maybe you'll receive the messages you need to heal. They’re ready. Let’s connect. Let's rise. Join Fern Olivia, Thyroid Yoga® founder, Reiki healer and Intuitive, in collaboration with Musicians Essie Jain and Patrick Glynn, for a slow and soulful practice at The Assemblage John Street. We will explore the magic of a Bhakti Yoga and Katonah Yoga® inspired practice weaving metaphor, sacred geometry and archetype, with particular attention to the lungs, thyroid, liver and adrenals. In celebration of spring moving into summer, we will dig deep and uncover the possibilities within ourselves. Is there something dormant that needs to reawaken or become known? Bhakti yoga is a style of yoga that helps us open our hearts through devotion, and awaken our sense of feeling with music. In this special class, we will unite our voices to unleash the creative qualities within, learn about the yoga of sound, practice asana, and enjoy a sweet savasana with live music from Essie Jain and Patrick Glynn, accompanied by Reiki and aromatherapy with all organic essential oils by Fern Olivia and Ajai Alchemy. FREE Admission - Please sign up in advance HERE to reserve your space. Please join us Mother's Day weekend for the second Uprising Retreat! This time it will be held at The Integratron, a wild and wonderful structure that was built in 1957, in the mystical desert Landscape of Joshua Tree, California. Drive out for the day or stay at an AirBnB with your friends or family! It's a beautiful time to heal the generational mother line and repair the feminine field. Join us as we work through the human energy system to realign internal pelvic tension patterns suppressed by fear, grief and trauma. Gina Calderone, MPT will guide you through a unique body scan to help you detect the areas that need your attention. We will knock on the doors that need opened and explore the rooms that need cleansed. Throughout this process, musicians Essie Jain and Patrick Glynn will create harmonies, textures and rhythms using variety of instruments, including Voice, Harmonium, Guitar and Pedals, to help uplift and elevate the body, mind and soul. Tuning and moving into the resonance of live music invites a spaciousness and opening a sacred part of ourselves, facilitating a deeper connection to oneself, others and our environment. Let’s deepen the bond between our mother’s, daughters and girlfriends. Let’s build trust, support and help each other rise. Bring your own mat, journal and pen. Please wear comfortable clothing that you are free to move around in and an extra layer, socks for conscious rest. All props and blankets will be provided. Please email info@cforcestudio.com to register in advance. There are only 35 spaces available for this very special day! This 90 minute class combines the best of both worlds. The first hour is a sweaty, intricate vinyasa practice. The last 30 minutes delves into Yoga Nidra, the practice of Yogic Sleep. You will be guided you through a detailed sleep meditation savasana that will leave you completely and utterly relaxed. Patrick and I will be playing live music for a morning of yoga and community to raise money for EVERYTOWN, which is a movement of Americans working together to end gun violence and build safer communities. An open level vinyasa class will taught by Maria Cutrona, Ashley Dorr and Sara Blackwell, with live music by Essie Jain. Following that there will be a brief advocacy chat and refreshments provided by Baba Cool Cafe. Wellness on the Inside and Out: Beautiful Body, Mind and Soul. Rodney Yee invites you to explore and experience an evening of wellness and beauty experiences, celebrating the launch of the new Gaiam Studio. Live Music by Essie Jain. Yoga Shanti's Urban Zen offers a wonderful session of restorative poses, aromatherapy, reiki, breath awareness, and guided meditation. Taught by Gillian Cilibrasi, with live music by Essie Jain and Patrick Glynn, this special class will be a gentle retreat from the city and a journey back to yourself. Warm into the deep of the winter and nourish yourself in the coziness of the holiday season, as we create and hold a space for you to feel grounded and peaceful. Using gentle movements and gentle music, we can invite calmness and awareness in, soothing our bodies, minds and spirits. Join us on Friday, December 8th for a special night of yoga, live music, and a festive gathering to follow! Bhava Yoga class will be led by Tara Glazier, Susan Kotcher, Nancy Rich & Paula Marques with live music by Essie Jain. Stay afterwards for a community potluck and pick up some gifts at our Holiday Market put together by local artists and teachers. Feel free to bring a dish or drink to share. Flow on the yoga mat, with live music accompaniment by Essie Jain on Voice and Harmonium. Joined by Patrick Glynn on Guitar and Pedals. Flow on the yoga mat, with live music accompaniment by Essie Jain. Joined by Patrick Glynn on Guitar and Pedals. Honoured to be joining these wonderful ladies on retreat as a special guest. I will be sharing and performing live music for the yoga classes on Saturday evening and Sunday morning. This is sure to be a rejuvenating, peaceful and transformative weekend, surrounded by the kind presence, healing energy and life force that is created when women gather together.